The sea floor is a habitat especially rich in species that produce calcium carbonate shells or skeletons – so-called marine calcifiers. Sea urchins, sea stars, coralline algae, crustaceans, and numerous mollusks, such as mussels, find their home here. Marine calcifiers play an important role in global biogeochemical cycles and serve important ecosystem functions. They are a food supply for other organisms and store carbon. At present, the ocean takes up a quarter of the CO2-released to the atmosphere by human industrial activities – with long-lasting consequences for the chemical composition of seawater and marine habitats. In a new study recently published in the journal Global Biogeochemical Cycles, scientists of Kiel University (CAU) with colleagues from GEOMAR Helmholtz Centre for Ocean Research Kiel and international partners from the USA, New Zealand, and Great Britain studied marine benthic shell-forming organisms around the world in relation to the chemical conditions they currently experience – with a surprising result: 24 percent, almost a quarter of the analyzed species, including sea urchins, sea stars, coralline algae or snails, already live in seawater unfavorable to the maintenance of their calcareous skeletons and shells (a condition referred to as CaCO3-undersaturation). More than 100 marine benthic calcifying taxa, from the coastal zone to the deep sea, from tropical, temperate and polar regions, were included in this comprehensive study. “The result surprised us a lot. For us, it is a sign that many marine organisms actually can live and maintain their calcareous shells under chemically unfavorable conditions which may reflect their physiological and evolutionary history”, says lead author Dr. Mario Lebrato from the Institute of Geosciences at Kiel University (CAU). Chemical parameters change when carbon dioxide dissolves in sea water. The pH decreases and the water becomes less alkaline and increasingly acidic. Ocean acidification is therefore one of the most important research areas regarding the effects of elevated CO2 on benthic marine calcifiers and the marine ecosystem in general. Many organisms incorporate magnesium when they build their skeletons and shells. These organisms appear to be particularly vulnerable to ocean acidification because their shells and skeletons are more vulnerable to dissolution than pure calcite and aragonite. For their investigation, an improved indicator (ΩMg-x) that reflects the saturation state of seawater with respect to the Mg-content of specific organisms was calculated by the scientists. Up to now previous investigations focused on calcite or aragonite saturation state as indicators of calcifiers thresholds, which may completely miss the vulnerability of many calcifiers. “Calculating the seawater saturation state for each individual organism using their Mg-content potentially enables us to assess each species vulnerability to ocean acidification. Our calculations also consider the natural conditions of temperature and depth”, says Lebrato. Yet, authors argue that we may consider if previously known threshold values that could put at risk organisms, are indeed correct. We commonly use a nominal value of 1 as the start of dissolution, so “danger” for organisms, but this may not be relevant for them because they have already evolved in these conditions, thus may be adapted. This guarantees further research into the topic, especially on the Mg-calcite solubility to further understand how organisms cope with these seawater conditions. This study also provides clues of how ocean acidification may impact marine organisms. 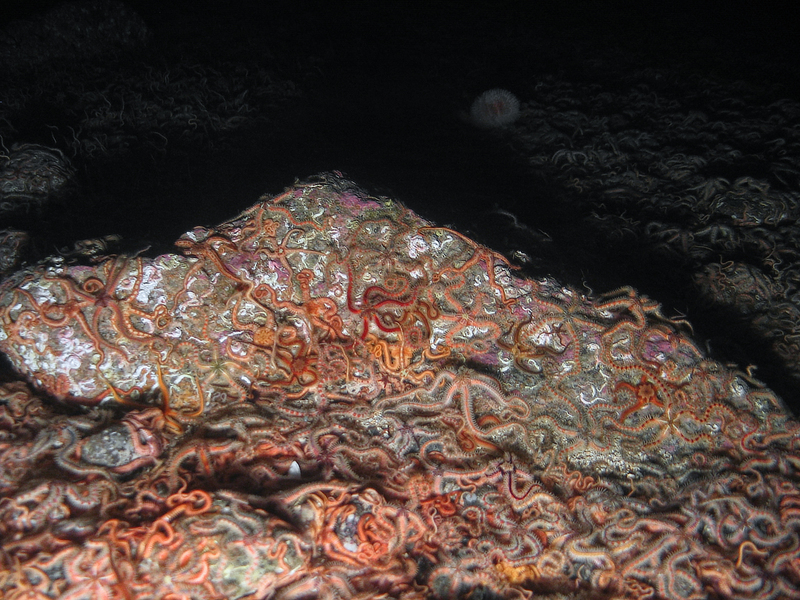 The surprisingly high percentage of those benthic organisms that are able to exist in undersaturated conditions suggests that some marine organisms may be more resilient to ocean acidification than originally predicted. However, caution must be exercised because the overall health of organisms inhabiting undersaturated conditions was not evaluated in the present study. And the question remains: how will the residual 76 percent of the investigated organisms that were not found to inhabit undersaturated waters respond to future ocean acidification. The scientists hope to gain more insight into this by exploring how past changes in seawater pH have impacted these organisms, but also through further field and laboratory studies testing the effect of ocean acidification on these calcifiers . This study has been realized within the Cluster of Excellence “Future Ocean” of Kiel University. 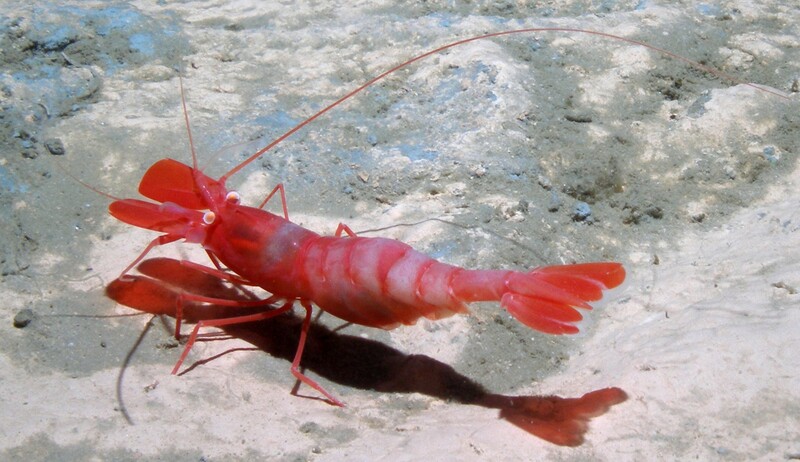 How organisms like the deepwater prawn cope with undersaturated waters? Scientists from Kiel try to understand that. Serpent Star on the ocean floor in the Atlantic ocean.